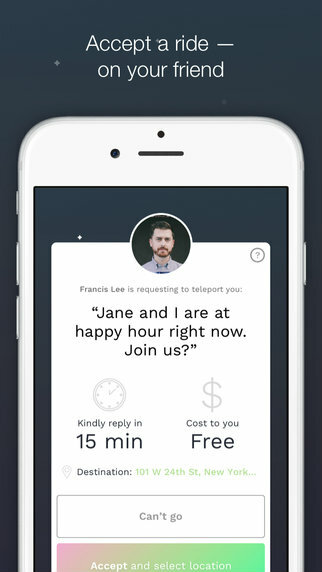 Teleport lets you order an Uber to bring a friend to you. I’ve lived abroad for the past four years, which means that I’ve bemoaned the fact that no one has invented teleporting yet, many, many times. And while the Teleport app does not, unfortunately, solve problems like missing my family over the holidays while I sit in Vietnam and they’re in Vermont, it does solve the problem of how to get people you care about to you as easily as possible. Teleport is a brand new app that lets you order an Uber for a loved one as long as they’re in a 100-mile radius. All you have to do is download the app (duh) and then tell them who you want to see. Teleport will send a notification to that person, even if they don’t have the app themselves, and, once they accept, will send an Uber to pick them up. Have you ever gotten into a back and forth about where you should meet? Or whose house you should hang out at? Teleport is an awesome way to get rid of that conversation. All you have to say is, “Look, dude. I’ll pay for your Uber. I’ll even send your Uber!” It’s also a great way to impress a first date. (Although I’d recommend having the car sent to a public place, like a restaurant. Not your house. That’s kind of creepy.) You could also use it when you’re parting ways with someone and want to make sure they get home safely. Sadly, I’m still waiting for the Teleport app that will bring me home for Thanksgiving but in the meantime, I hope you all enjoy this Teleport app that will hopefully bring you and your loved ones just a little bit closer.